Need: Civilians need basic training in Bleeding Control principles so they are able to provide immediate, frontline aid until first responders are able to take over care of an injured person. Due to many situations, there may be a delay between the time of injury and the time a first responder is on the scene. Without civilian intervention in these circumstances, preventable deaths will occur. Mission/Objective: The American College of Surgeons Committee on Trauma is leading the effort to save lives by teaching the civilian population to provide vital initial response to stop uncontrolled bleeding in emergency situations. 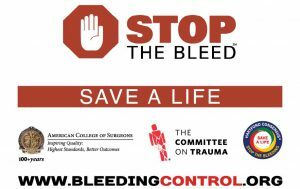 This will be accomplished by the development of a comprehensive and sustainable bleeding control education and information program targeted to civilians that will inform, educate and empower the 300+million citizens of the United States.